Once again UPR is at the fore front in Billet Interior Accessories with our new "Push On" Billet Slimline Style Headlight Knob Cover, which will give your dash a bright and shiny new look. 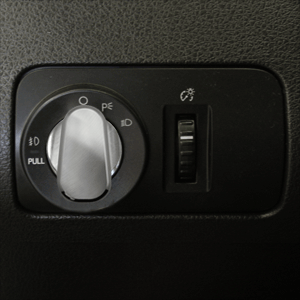 Cover up those plain black plastic knobs with out 100% Billet Aluminum A/C Knob covers for your 2005-2014 Mustang. Installs in 5 minutes or less with nothing more than a drop of automotive silicone adhesive (not included). 2005 2006 2007 2008 2009 2010 2011 2012 2013 2014 GT500 GT V8 V6 Mustang Shelby Roush Saleen Vehicles. No one else can stack up to the bold clean styling of our aftermarket Billet dress ups, Street Strip & Racing Suspension & Performance Parts for your late model American Muscle Car!